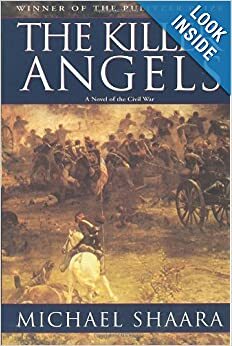 I am reading the classic novel, “Killer Angels” by Michael Shaara, in preparation for a leadership development experience in Gettysburg that I am so excited about. Here is what I am thinking about as I prepare. This reminded me so clearly to what a wiser and more seasoned leader once told me. “Love people well. Then challenge them.” That advice lead me to trust God for more than I ever had at that point and see him do more than I could imagine. It seemed similar to me to what the Colonel said in the book. May be they both can be summed up by, Care and Courage. Two essential ingredients to leadership. How do you lead with care and courage? The Great commission is clear. As followers of Christ we must obey the command to “Go and make disciples of all nations.” Not just obedience but out of love for God and knowing his loving heart for those who do not yet know him (II Corinthians 5:11-21). The question is how? How do we go and make disciples of all nations? A friend of mine Don Mansfield has helped many people in the area of how to do evangelism. His model is called “Boldness and Clarity.” It has been really helpful for me to think through his thoughts on the 2 key verses that talk about how we are to speak about the gospel. The above principles of boldness and clarity have helped me, as have the modes of evangelism. I will begin writing on the modes next week. What has helped you obey the great commission? Bill Bright founder of Cru defined successful evangelism this way. Although simple and easily memorized it is also a challenge to live out. You must know the Gospel, then know how to speak about the Gospel in the power of the Holy Spirit. The key we must remember is that the results are out of our control. God is in control. In John 14:6 Jesus said , “I am the way, and the truth, and the life. No one comes to the Father except through me.” So people don’t come to the Father through our presentation or living out of the Gospel. They come to God through Jesus. This takes the pressure off of us as those that follow Christ and obey the great commission. It has also helped me to realize that if I can’t lead anyone to God, then conversely I can not lead anyone away from Him as well. My “poor” proclamation of the Gospel cannot “make” or force anyone not to believe. That too is outside of my control and in God’s control and the responsibility of the person I am talking to. Because of these truths our focus can be obedience to speak the Gospel to people, and follow the Holy Spirit. This definition of evangelism keeps it simple and takes the pressure off. How would you define successful evangelism? After reflecting on and telling my story to a group of pastors and missionaries at a missions conference I had these thoughts. When I came to Christ 2 things changed. 1. My view of God from condemning to forgiving. 2. My view of myself from fine on my own to in need of help from a savior. Although my very identity has been changed and he will never leave me and never forsake me I still find the same changes take place in me. When I am not experiencing God I am thinking wrongly about Him. He is condemning and I have to prove my worth to Him and secondly I am just fine, and will prove it to him. Since this is impossible and untrue both of God and of myself a change is needed. I need to think rightly about God and myself just like I did when I first came to know Jesus. Jesus as my loving and forgiving God with no condemnation for me any longer. I also need to see myself as a needy dependent child who can’t do anything for God with out his help and enablement. I am so thankful for the reminder that I never graduate from these basic an profound truths. Father thank you so much for living me enough to give your Son for me. Thank you for not allowing me to live with a false view of You or a false view of me. I love you and I need you. Live your perfect life though my imperfect life. At Passion 2012 the talk that came back to my mind the most was Piper’s. A few weeks after the conference I reread my notes from Pipers talk this year and again they have been helpful to me. So I am posting them here for you unedited and taken on my phone. 1. Jesus is the key that unlocks the mystery of history. He is the center of the story of history. 2. The reason he is center who is able is because He is a lion and lamb. 3. He turned people into a kingdoms of priests. 4, Jesus is infinity worthy of praise and glory. The universe is created to display the glory of God. There is a connection between our worship and gods glory. In this universe the intensity of our joy displays the infinity worth of Jesus. In the heaven there will be no obstacles from our enjoyment of Jesus and endless new and creative ways to enjoy Him. If you are in Christ that is your future. Your admiration of the infinite worth of Jesus. I am laying a foundation for the sacrifice of love for the cause of liberation. If you do this you will suffer. This foundation not only allows us to not only endure suffering but embrace it. Not only endure suffering but walk into it, embrace suffering. A pattern of power to suffer. 1. A heart joyfully treasuring the reward. A soul satisfaction of a Christ saturated future. 2. That sole satisfaction frees you from self protecting fear. 3. The fruit is fearless love no matter the cause. Amazing – They joyfully accepted the plundering of the property. Since they knew they had a better inheritance, reward. By faith Moses choosing rather to be mistreated with the people of God. He looked to the reward. The greatest act of liberation in the world was Jesus freeing those who believe in Him on the cross. How did the God Man have the ability to embrace the cross. V2 the joy set before him. They are saying to have a higher motivation than Jesus. Jesus looked to the reward. You have to ask yourself are you going to belive the ethical teacher or the Bible. Are you going to belilve them or follow Jesus’s example. The satisfaction they had in Christ was the power that freed them to love. That satisfaction broke the power of selfishness. Why isn’t it selfish to love another for your own reward? Because your reward is to include them in the reward that you are looking forward to. It is not an accident that the greatest chapter of the Bible ends this way. Who shall separate us from the live of Christ. Reading has not been a strong suit for me. as an extrovert slowing down and shutting my mouth long enough to read is a challenge. But I knew that needed to change. I had heard the phrase too many times. Readers are leaders and leaders are readers So I have attempted to slow myself down and read more. Here is what I read this past year. I am posting it for my own encouragement. All I can say is that I did better than last year. 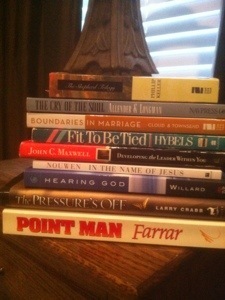 Point Man by Steve Farrar – Some good thoughts on being a husband, father and follower of God. Developing the Leader Within by John Maxwell – Some great thoughts on leadership that have changed the way that I think about leadership and lead others. Cry of the Soul by Dan Allendar and Tremper Logman III- Best book I have read on emotions and there intersection with our faith in Christ and relationship with God. Grip of Grace by Max Lucado – this was a re-read to help me to get grace again. You Lost Me – David Kinnaman The Millennial generation and their Christian faith experience. The Pressures Off – Larry Crab – This challenged my thinking on blessings & the One who Blesses. In the Name of Jesus by Henry Nowen – Great thoughts on ministry and spiritual leadership. Hearing God – Dallas Willard – a challenging and intellectual read about hearing God’s voice. Glad to read one of my Dad’s favorite books and share that with him. As I look back at this list I am surprised that I was able to read this much and thankful to God for the help and my wife Adrienne for helping me to start this newer habit for me. I am also hopeful for 2013 that I will continue this habit with the help of God, and friends. I enjoyed being at Passion 2013. Personally it gave me a lot to think about on many fronts. Since my job is Campus Ministry with Cru I had many thoughts about how to do campus ministry. Of course comparison between Cru and Passion doesn’t really work since our models of ministry are so different. Cru’s focus on the great commission through evangelism and discipleship and Passion’s focus on ending slavery. But yet we have much in common as well. We both work with college students and desire to give glory to God and celebrate Jesus who died for us so that we could be free and use the freedom He gave us to liberate our friends. God allowed me to experience that verse in action on a summer mission trip to Zambia one summer where in one week God used a group of Cru students, Zambian Cru Staff and church members to start a campus ministry of 50 students in one week (Read the Post). During this talk I sensed that God wants to do immeasurably more though Cru at FSU. God strengthened me and encouraged me to continue to take steps of faith because he is with me and He can do immeasurably more through me than I can even ask or imagine. So leaving passion I am planning on working with all of his strength and excited to see all that God will do.